Posted on Tue, Oct 18, 2011 : 9:04 a.m.
We had heard about the goodness of kale chips for at least a year or two, maybe longer, but for some reason, we hadn’t got around to making them at home. I had tasted them in a Preserving Traditions workshop on the wonders of kale, read Corinna Borden’s piece on Annarbor.com, heard friends exclaim over what they like to call Oven Fried Kale, and listened to a dietitian discuss their benefits in a talk on healthy eating. I’ve recently seen commercial bagged kale chips for sale at the Co-op and other stores. Finally, a couple weeks ago in the big push of getting things out of the garden and into the house, we gave home-made kale chips a try. And we are so glad we did! The embarrassingly simple recipe follows, which can be jazzed up with a tiny effort. Buy or harvest a bunch of kale and try them out. Dare people to try them and enjoy the pleasant look of unexpected delight on their faces. Don’t be surprised if you want to make and eat more as soon as you are done! Tear kale leaves off of the tough stems, and then tear into bite-sized pieces. Wash kale and dry well. A salad spinner works great for this. Blotting with paper towels or a clean tea towel will work in a pinch. Spread kale in a single layer on a cookie sheet. Don’t over-crowd. If you have a lot of kale, use 2 trays. Drizzle with olive oil. Then use your hands to toss the kale leaves to coat evenly. Sprinkle on salt and Parmesan. 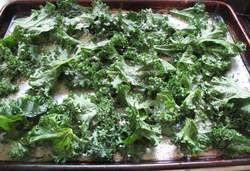 Bake for 10- 15 minutes until the edges are slightly brown, and the kale is crispy. Check often in the last 3 or 4 minutes so that you don’t scorch the kale chips. My advice is to eat them as soon as they are ready. I haven’t found that storing them is satisfactory, although some kale-lovers place them in plastic bags for eating later. We like them just out of the oven. 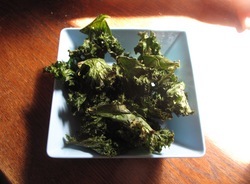 Kale chips are a great snack or a tasty appetizer for a cool fall day. Janice and Jim Leach have been gardening together for close to 30 years. They tend a backyard plot in downtown Ann Arbor, where they try to grow as many vegetables and other plants as possible. For the last four years, they've published gardening tips, photos and stories at their 20 Minute Garden website. Tue, Oct 18, 2011 : 8:20 p.m. Though I haven't made them in a while, I very much enjoy baked kale chips. I haven't used parmesan cheese, but will try it next time. I generally add freshly ground pepper along with a little bit of salt. You are correct that making more rather than less is the smart way to go. I have never had any left over, even from a large bunch of kale. I have tried the packaged kale chips sold at Whole Foods and have found them to taste awful. For anyone considering trying baked kale chips, do not be dissuaded if you have tried and disliked the ones sold prepackaged as they taste nothing like homemade. Sat, Oct 22, 2011 : 3:07 a.m. Thanks for your comments! Next time we make kale chips, I'll try adding some black pepper. I find the flavors intensify with these kale chips. A little oil, salt, and Parmesan go a long way! I've heard of people adding other flavors to &quot;spice up&quot; kale chips, like garlic or cayenne. I may do that some time, but we haven't tired of our &quot;regular&quot; kale chips yet!